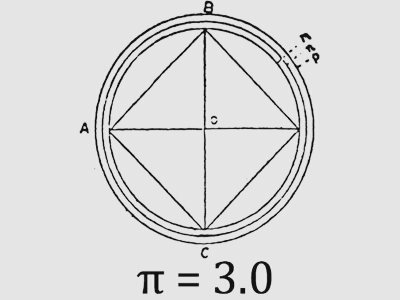 The April 1998 issue of the New Mexicans for Science and Reason newsletter contained an article claiming that the Alabama state legislature had voted to change the value of the mathematical constant pi from 3.14159 to the 'Biblical value' of 3.0. Soon the article made its way onto the internet, and then it rapidly spread around the world, forwarded by email. It only became apparent how far the article had spread when the Alabama legislature began receiving hundreds of calls from people protesting the legislation. The original article, which was intended as a parody of legislative attempts to circumscribe the teaching of evolution, was written by physicist Mark Boslough. In April 1934, many American newspapers (including The New York Times) printed a photograph of a man flying through the air by means of a device powered only by the breath from his lungs. Accompanying articles excitedly described this miraculous new invention. The man, identified as German pilot Erich Kocher, blew into a box on his chest. This activated rotors that created a powerful suction effect, lifting him aloft. Skis on his feet served as landing gear, and a tail fin allowed him to steer. What the American papers didn't realize was that the "lung-power motor" was a joke. 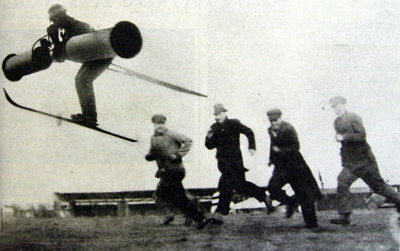 The photo had first appeared in the April Fool's Day edition of the Berliner Illustrirte Zeitung. It made its way to America thanks to Hearst's International News Photo agency which not only fell for the hoax but also distributed it to all its U.S. subscribers. In the original article, the pilot's name was spelled "Erich Koycher," which was a pun on the German word "keuchen," meaning to puff or wheeze. April 1, 1972: Newspapers around the world reported the sensational news that the dead body of the Loch Ness Monster had been found. A team of zoologists from Yorkshire's Flamingo Park Zoo had come across it while working at the Loch. The researchers tried to take the Nessie corpse back to Yorkshire, but Scottish police promptly stopped them, citing an old law that made it illegal to remove "unidentified creatures" from Loch Ness. However, subsequent examination of the creature determined that it wasn't actually Nessie. Instead, it was a large bull elephant seal from the South Atlantic. But how had it gotten to Loch Ness? This was revealed the next day when the Flamingo Park's education officer, John Shields, confessed responsibility. The seal had died the week before at Dudley Zoo. 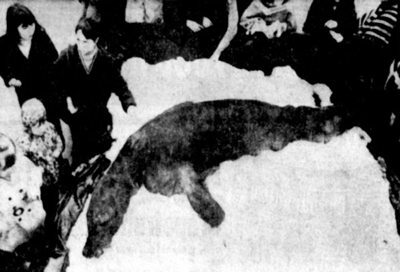 He had shaved off its whiskers, padded its cheeks with stones, and kept it frozen for a week, before surreptitiously dumping it in the Loch, intending to play an April Fool's prank on his colleagues. He admitted the joke got somewhat out of hand when the police became involved. 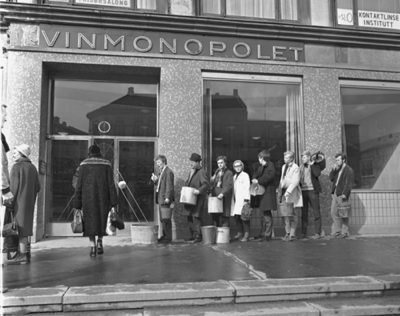 April 1, 1950: Aftenposten, Norway's largest newspaper, announced on its front page that the government-owned Wine Monopoly (Vinmonopolet) had received a large shipment of wine in barrels, but it had run out of bottles. To get rid of the extra wine, the stores were running a one-day bargain sale, offering wine at 75% off and tax-free. The catch was that buyers had to bring their own containers to put the wine in. "Buckets, pitchers, and the like" were recommended. When the Vinmonopolets opened at 10 a.m., Norwegian wine lovers rushed to line up, forming long queues that stretched around the block. According to legend, numerous empty buckets were later seen lying in the streets, left there by people who had realized, while standing in line, that the sale was a hoax. April 1, 1698: As reported in Dawks’s News-Letter the following day, "several persons were sent to the Tower Ditch to see the Lions washed." This is the earliest known record of an April Fool's Day prank. The joke was that there were no lions being washed in the Ditch (i.e. moat) of the Tower of London. It was a fool's errand. 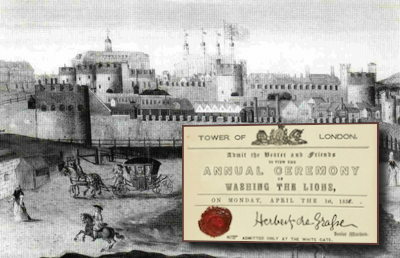 For well over a century after this, the prank of sending unsuspecting victims to see the "washing of the lions" at the Tower of London remained a favorite April Fool's Day joke. In the mid-nineteenth century, pranksters even printed up official-looking tickets that they distributed around London on April first, promising admittance to the (non-existent) annual lion-washing ceremony. 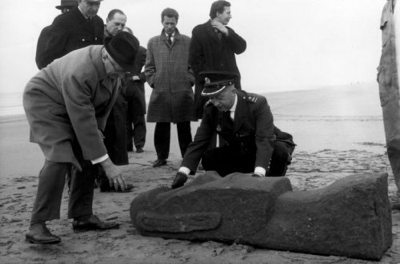 March 29, 1962: A man walking along the beach near the Dutch town of Zandvoort reported a bizarre discovery. He had found, washed up on the sand, a small statue that looked just like the famous statues on Easter Island. Based on the statue's weathered appearance, it seemed that the ocean currents must have carried it all the way from the South Pacific to the Netherlands. The discovery made headlines around the world. An expert from Norway confirmed that it seemed to be an authentic Easter Island artifact, and huge crowds showed up to see it. But on April 1, the man who had found the statue, a local artist named Edo van Tetterode, confessed he had made it and planted it on the beach, having been inspired by the research of Thor Heyerdahl. The next year, Tetterode created a National April First Society, which annually awarded small bronze replicas of the Easter Island statue to those who, in its estimation, had made the best jokes during the previous year. The society remained in existence until Tetterode's death in 1996. 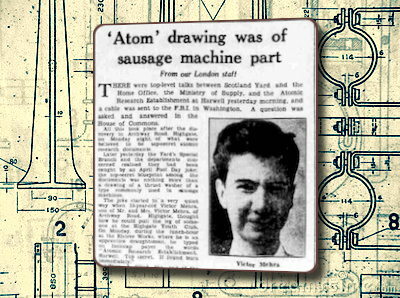 April 1, 1952: Two teenage boys walked into a London police station and handed over a folder that appeared to contain blueprints for an atomic device. The boys said they had found the folder lying on the pavement at a bus stop. British authorities immediately went into high alert. Concern reached the highest levels of government, with members of the House of Commons informed of a possible loss of atomic secrets. The media got wind of the situation as well, raising public alarm. But when physicists finally got around to examining the documents, they couldn't make any sense of them and eventually concluded they were meaningless. The mystery was solved when a friend of the two boys, 15-year-old Victor Mehra, confessed he had created the papers out of old Norwegian blueprints (including a blueprint for a sausage machine) he had found in the office where he worked. As a prank, he had written "a lot of gibberish" on the papers and titled them "Plan for Atomic Device C.D.ZZ 29679 Nuclear Physics Pattern O. 778523 — Top Secret." Then he gave the folder to his friends, telling them he had found it lying in the street. 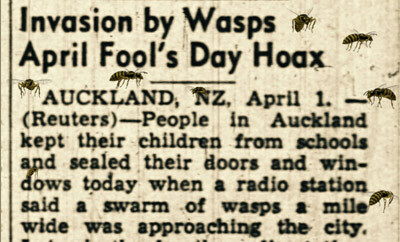 April 1, 1949: New Zealand DJ Phil Shone (of radio station 1ZB) warned his listeners that a mile-wide wasp swarm was headed towards Auckland, and he urged them to take steps to protect themselves, such as wearing their socks over their trousers when they left for work, and leaving honey-smeared traps outside their doors. Auckland residents dutifully heeded his advice, and panic grew until he finally admitted it had all been a joke. The New Zealand Broadcasting Service wasn't amused. Its director, Prof. James Shelley, denounced the hoax on the grounds that it undermined the rules of proper broadcasting. From then on, a memo was sent out each year before April Fool's Day reminding New Zealand radio stations of their obligation to report nothing but the truth. 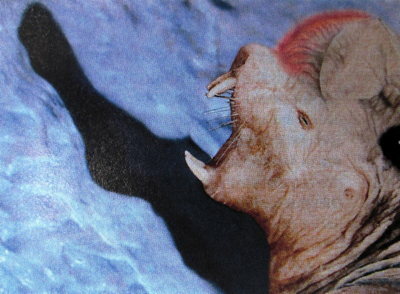 The April 1995 issue of Discover magazine reported that the biologist Dr. Aprile Pazzo had found a new species in Antarctica: the hotheaded naked ice borer. These fascinating creatures had bony plates on their heads that, fed by numerous blood vessels, could become burning hot, allowing the animals to bore through ice at high speeds. They used this ability to hunt penguins, melting the ice beneath the penguins and causing them to sink downwards into the resulting slush where the hotheads consumed them. After much research, Dr. Pazzo theorized that the hotheads might have been responsible for the mysterious disappearance of noted Antarctic explorer Philippe Poisson in 1837. "To the ice borers, he would have looked like a penguin," the article quoted her as saying. Discover received more mail in response to this article than they had received for any other article in their history. 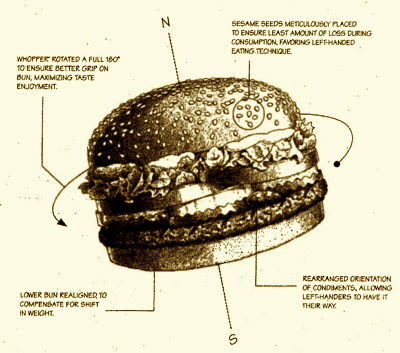 April 1, 1998: Burger King published a full page advertisement in USA Today announcing the introduction of a new item to their menu: a "Left-Handed Whopper" specially designed for the 32 million left-handed Americans. According to the advertisement, the new whopper included the same ingredients as the original Whopper (lettuce, tomato, hamburger patty, etc. ), but all the condiments were rotated 180 degrees for the benefit of their left-handed customers. The following day Burger King issued a follow-up release revealing that although the Left-Handed Whopper was a hoax, thousands of customers had gone into restaurants to request the new sandwich. Simultaneously, according to the press release, "many others requested their own 'right handed' version." Left-handed products of various kinds are actually an old joke on April first, but Burger King's announcement quickly became, by far, the most famous version of the joke.